Bottling lines are a common source of high noise levels, posing particular problems for noise reduction. Noise is generated as the glass bottles strike against one other along the conveyors. Assuming that plastic bottles cannot be substituted for the glass, the only means of reducing the noise at source is to space the bottles to prevent collisions. Although possible along straight runs, most bottling lines require the marshalling of bottles at entrances to, or exits from, particular parts of the line such as washers, inspection tables or craters. The only effective way to control the noise is to contain it within the line by acoustic enclosure or screening, which must be hygienic and allow immediate access to any section of the line. 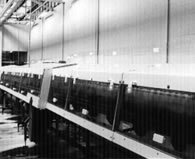 The main bottling hall of a major food manufacturer was a highly reverberant area approximately 20 m long x 6 m wide x 5 m high, containing a total conveyor length of some 30 m, with A-weighted noise levels above 85 dB. To reduce noise levels, an enclosure was erected over the conveyor. The roof was a polypropylene plastic sheet with an absorptive lining, faced with a thin plastic membrane to enable easy cleaning. The vertical side panels were in a transparent acrylic sheet, 13 mm thick, hinged at their top edges to allow operators rapid access. The side panels extended down to a few centimetres below the conveyor itself, but the area below was left open to enable excess conveyor lubricant to drain away. A noise reduction of about 5 dB. It was estimated that this could be increased to 10 dB by extending the side panels to the floor with acoustic strip curtaining, thus containing downward radiated noise from the conveyor bed. Photographs courtesy of SmithKline Beecham Consumer Healthcare.